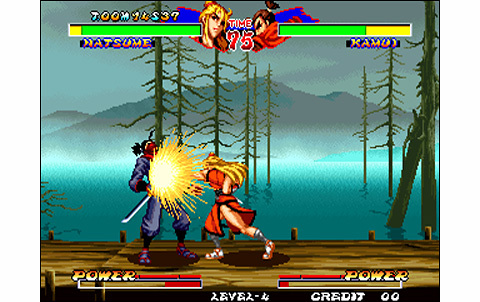 Ninja Masters, a splendid versus fighting game with weapons released in 1996, has more or less been ignored during its era of acute playstationis and saturnis. 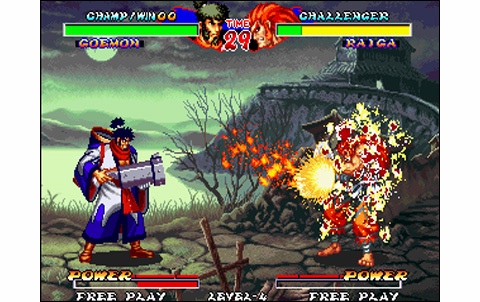 This original creation was made by the company ADK, which was already known for some great titles on the Neo Geo (Magician Lord, World Heroes, Ninja Commando, etc...). 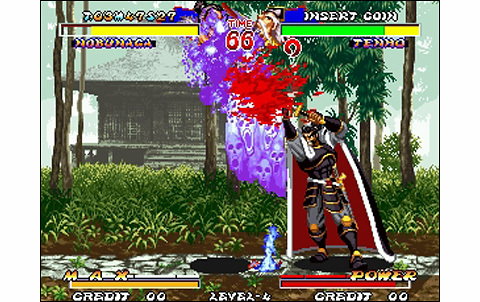 The soft stands as a true gem of fighting game on the system, as it's pretty rare and quite different from other titles of the genre. 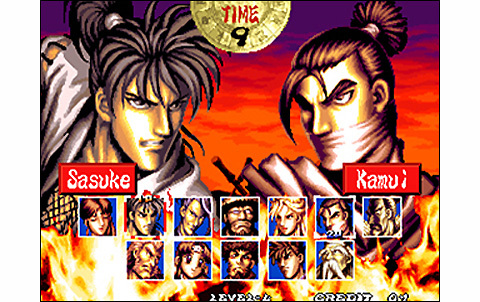 The system's library features prestigious titles such as Samurai Spirits, the cute Kabuki Klash, and also the divine "The Last Blade" episodes, released shortly after. Ninja Masters remains a little known title, seldom-appreciated for its true value because shunned in favor of the Samurai Shodown series. After an epic introduction, let's enter the real game. 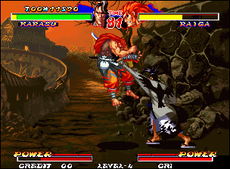 There are ten characters to choose among - even twelve with a code or the universe bios - all looking and playing very different from each other, but all requiring a careful learning with your beloved arcade stick. 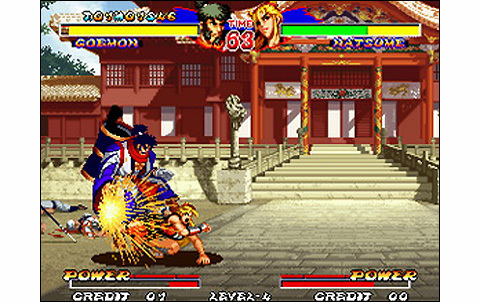 The game is heavily loaded with combos, and we can even say that these are the main feature of the game. Each character packs dozens and dozens of these combinations, with some that are simple and can be performed even by a beginner, but also more technical ones, requiring a lot of practice to be used in combat. 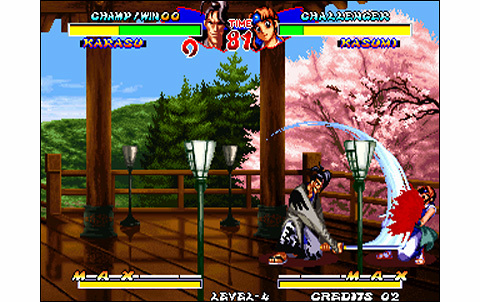 Desperation Moves and Super Desperation Moves are also included, as well as juggles, break shots and other complex gameplay features. 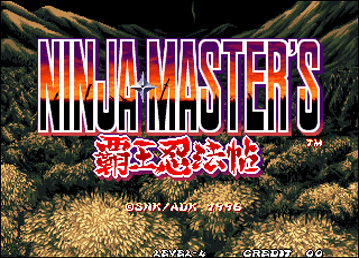 In fact, Ninja Masters offers a wide technical depth despite its reasonable roster. 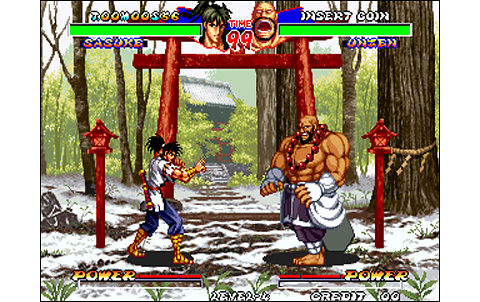 The controls are smooth: timing is precise but can be mastered soon with some practice, as well as patterns and combos, that can be learnt even by rookies. 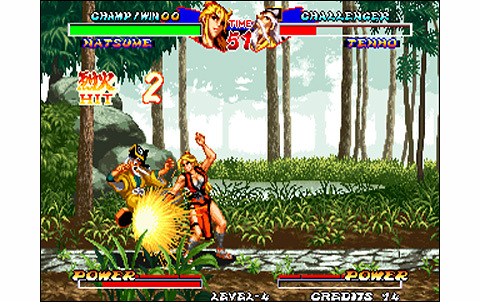 The four buttons of the stick are used as follows: A and B perform different weapon attacks, C and D control kicks; B+C gets the weapon out or stores it. Can you believe it? A multitude of kicks/punches/weapon combos is available then! The phisionomy of battles is shattered, with these possibilities multiplying the amount of techniques and combos you can use. 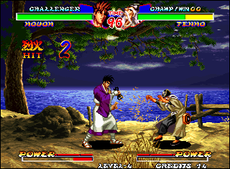 It’s up to you to choose your strategy at any moment of a duel: using the speed and finely pulled punch/kicks combinations, or power slashes, counter attacks and combos with weapon... Indeed, it's also possible to link an armed attack, store your sword to keep punching with bare hands... a good feature! 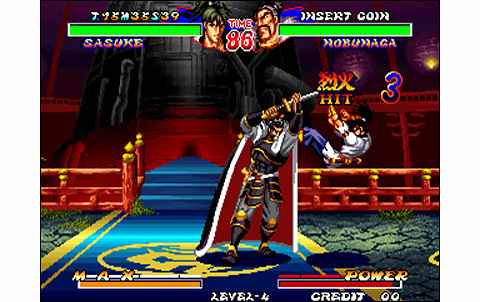 Besides this innovative gameplay in a sword-fighting game, the game design is also to be mentionned. 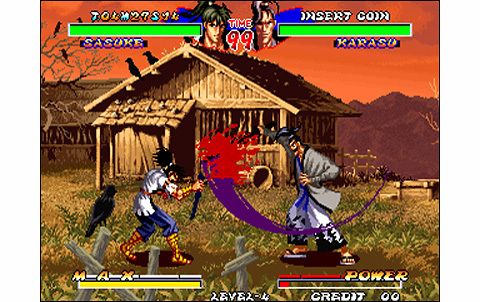 Less pure than a Last Blade or less 'bigger than life' than a Samurai Spirits, the graphics are nonetheless remarkable in every way. Particular, typical and lively, the backgrounds exude a genuine aura and the landscapes invariably transport you in the country of the rising sun, hundred years ago. Some stages are better designed than others, but however, the whole graphic performance is high-quality and harmonious. Although not being the ultimate reference, the animation doesn't suffer any defects: the characters' moves are fluid and damn well decomposed. 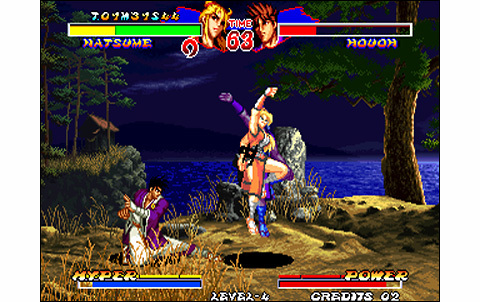 Without proposing very large sprites or zooms, the game successfully plays the card of simplicity. The landscapes are very lively thanks not only to the different effects (flames, impacts) that are well designed, but also with the sounds. 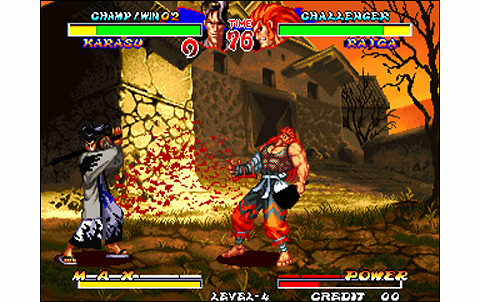 In particular, the blows sounds are pretty violent, as most fighting games players love them! On the other side, music scores are discreet but pleasant, with war drums and martial themes perfectly fitting the action. The vocals are also doing good, but this is pretty usual on the Neo Geo. Besides, there's one detail that will please everyone: the game is downright bloody! Sprays of red blood occur when a slash hits its target, a true bloodbath! 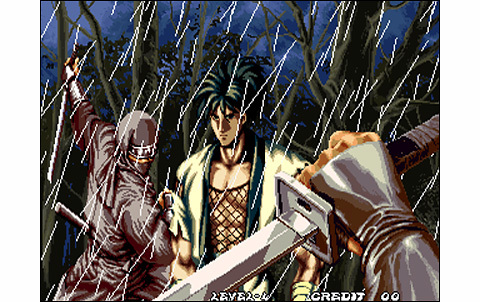 Like in the Samurai Spirits series, you can cut your opponents in pieces, which is a detail that experts - but also psychopaths - will appreciate. A blade game that I strongly recommend, as it packs a very personal and artistic design, and an incredible, unique martial atmosphere. 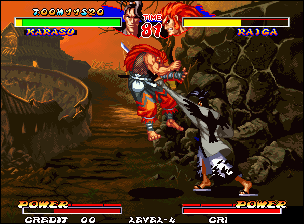 Also, let's not forget its fantastic gameplay, full of combos and particularly fun and rich. 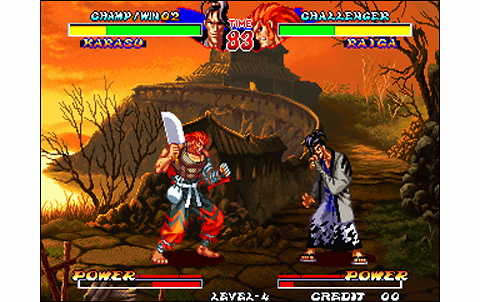 It changes a bit from the Samurai Shodown series, by proposing an alternative game rather different from anything we knew before. Backgrounds and characters are gorgeous and very personal. The whole game is lively, beautiful and varied. 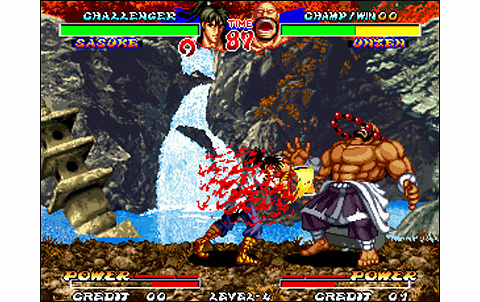 All that is required in a good VS fighting game is here: fluidity, decomposition and speed. Special mention to the lively backgrounds. The melodies are nothing special but they fit well the action and drama. Besides, the various sound effects are splendid. It's a tough challenge to clear the game with each warrior. Handling every single one perfectly is even more difficult, but rewarding. 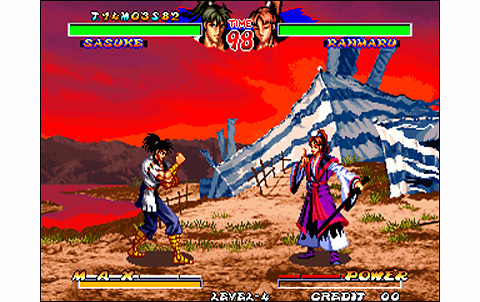 More subtle than Samurai Spirits, the combo system gives the choice to fight bare hands or with a weapon. The controls are great and mastering the hundreds combos of the game is pleasant and taking. 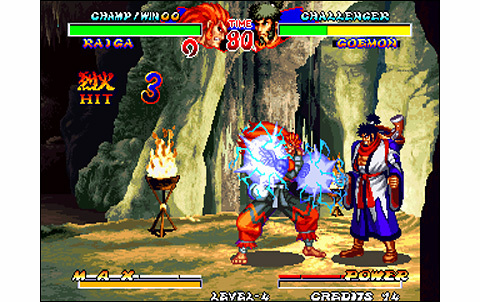 A great versus fighting game, largely unknown, that all aficionados should try! 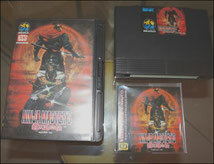 The game is rare and therefore expensive, averaging more than 500 Euros in AES format. It’s a shame as it really deserves to be discovered by many. 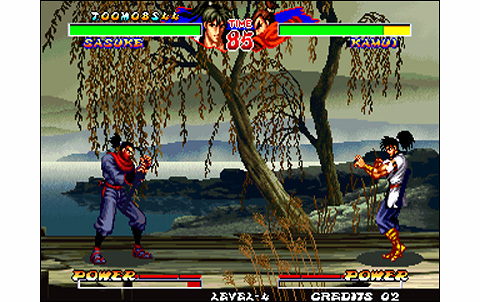 Prefer Samurai Spirits II, the best game in the genre in terms of value/money rate.